Partial- versus full-thickness wounds should be a straightforward understanding, right? For some reason it is not. It is one of the most common documentation mistakes or inconsistencies that I observe. Validating wound depth is critical from a documentation standpoint in every sense. Wound care billing and reimbursement of procedures, dressings, and durable medical equipment are essentially determined by wound depth. I have compiled a list of common terms that I see used incorrectly and/or inconsistently. Below is a brief review of common conditions and those they are often mistaken for; for a full review of these conditions, visit my previous blog, Common Wound Care Documentation Mistakes and How to Avoid Them. Scabs are PARTIAL-thickness. The term “scab” is used when a crust has formed by coagulation of blood or exudate. Eschar is FULL-thickness. Eschar is dead tissue found in a full-thickness wound. You may see eschar after a burn injury, gangrenous ulcer, fungal infection, necrotizing fasciitis, spotted fevers, and exposure to cutaneous anthrax. Stage 2 pressure ulcer/injury contains NO granulation. Now that we've taken a moment to review these conditions and how to tell the difference between them, lets look at some hypothetical case scenarios detailing how some common wounds might be mis-documented. Scenario #1: You have a patient with a non-blanchable area to the left heel. You describe the injury as an erythematous, pink, and dry area with a measurement of 4×4×0.1cm. The wound has been staged as a pressure injury stage 1. INCORRECT: The measurable depth indicates tissue loss, along with pink wound tissue, which validates a stage 2 pressure injury = partial-thickness. Scenario #2: You have a patient with a pressure ulcer/injury to the coccygeal region. You document that the wound is 100% pink granulation. You stage the wound as a stage 2 pressure injury. INCORRECT: Granulation is not possible in a stage 2 pressure injury. Referring to the wound bed tissue as granulation validates a full-thickness wound. The wound is a stage 3 pressure ulcer/injury = full-thickness. Scenario #3: You have a patient admitted to your facility with a pressure ulcer/injury to the right heel. It consists of 50% black eschar and 50% yellow slough. You palpate the area and feel comfortable documenting a stage 3 pressure injury. The following week during rounds, you notice a small pinpoint area within the eschar and slough mix you can now probe to bone. The stage is now a 4, showing a decline in wound progress. INCORRECT: The devitalized tissue percentage validates an unstageable pressure injury. Staging the pressure ulcer/injury as a 3 on admission made it appear the wound had declined. Is it also possible the pinpoint open area was missed on admission? The tissue level of destruction was full-thickness on admission and possibly to bone. Scenario #4: Documented MASD to the right buttock measures 3×3×0.2cm. The tissue is 20% slough and 80% granulation. INCORRECT: This area is full-thickness. Any devitalized tissue validates full-thickness tissue level of destruction. The wound must now be staged. It would be a stage 3 pressure injury. Scenario #5: You have an acquired, unstageable pressure ulcer/injury. Wound tissue type is 100% black eschar. The treatment nurse documented a suspected deep tissue injury (sDTI) dry scabbed area intact, measuring 4×4×UTD (unable to determine). INCORRECT: The term “scab” is found on a superficial or partial-thickness wound. The pressure ulcer/injury stage is unstageable. This is a discrepancy in documentation. Scenario #6: A physician has documented, "sharp debridement, removed eschar," when it was actually a scab. INCORRECT: This is now considered a full-thickness wound, leading to an incorrect billing code. 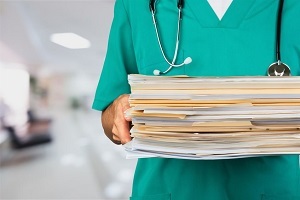 Documentation is critical to ensure accurate reimbursement for the procedures performed. There is an increase in wound-related lawsuits in every health care setting. Most of these lawsuits are pressure ulcer related: common snags and gaps in documentation, wrong pressure ulcer/injury staging, and implementation of treatment are just a few of the possible causes. Weekly audits of wound care documentation will help minimize discrepancies. 1. Baranowski S, Ayello E, eds. Wound Care Essentials. 3rd ed. Philadelphia, PA: Lippincott Williams & Wilkins; 2011. 2. Centers for Medicare & Medicaid Services. MDS 3.0 Manual v01 07. US Department of Health and Human Services; 2018. http://www.cms.gov/Medicare/Quality-Initiatives-Patient-Assessment-Instr.... Accessed 23 January 2019.